The American Silver Eagles are internationally well-known and praised series on the market, highly appreciated among investors and collectors. First established on November 24, 1986, these stunning coins present the American traditions of patriotism, freedom, and equality. 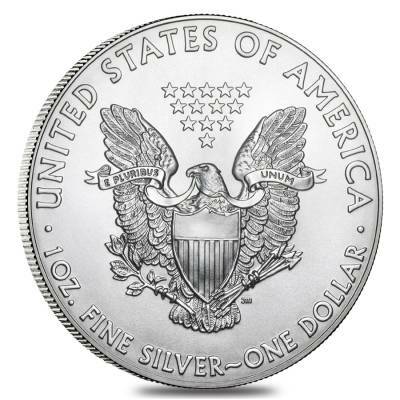 The American Silver Eagle is the one official silver bullion coin, backed by the United States Government. 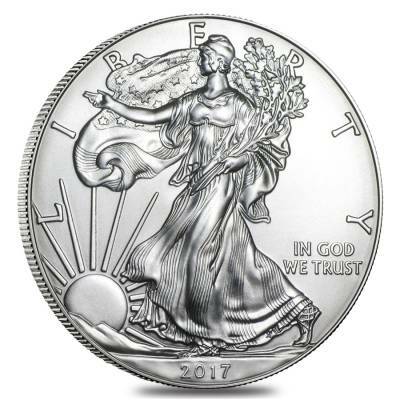 This beautiful coin is struck from .999 fine silver, featuring the highly recognizable design of Walking Liberty, created by famous illustrator Adolph A. Weinman. The reverse displays a design created by John Mercanti, featuring a heraldic bald eagle with a banner in its beak. Above its head, there are 13 stars arranged in a triangular pattern. Since 2001, these coins were minted at West Point facility however this coin was minted at San Francisco location. 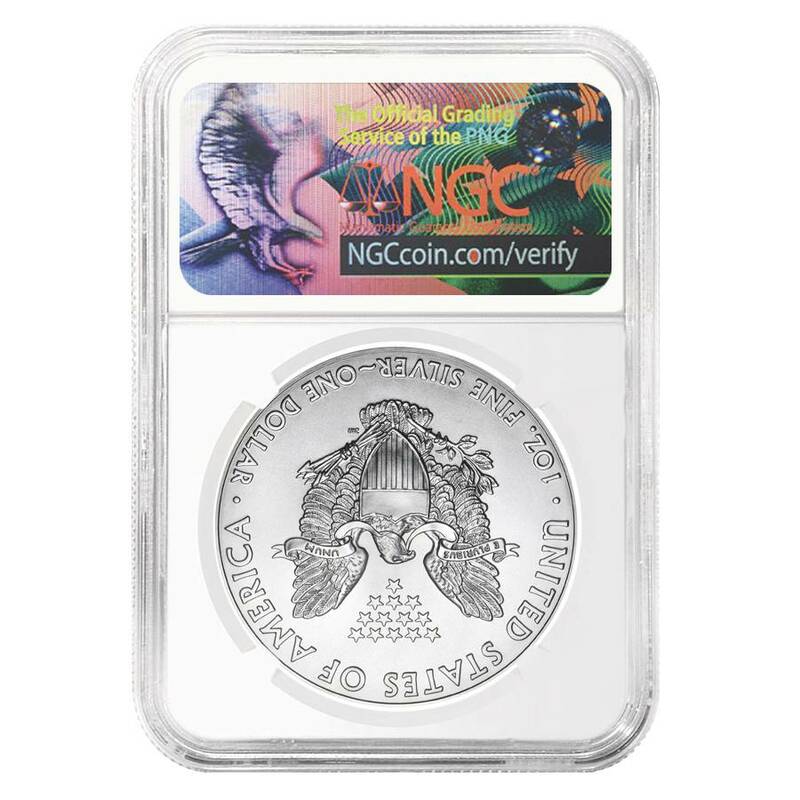 This coin was also verified by the trusted grading company - NGC as Mint State 69, which means that this is a fully struck coin with nearly imperceptible imperfections. This designation not only adds value to coin but also takes coin collecting to another level with unique opportunities to protect your portfolio. PCGS and NGC can now identify 2014-2017 Silver American Eagles with their Mint location. During those years, the production of Silver American Eagles traditionally took place at the West Point Mint facility, which is also home to a strategic bullion depository. However, facing a record demand for American Eagles, the U.S. Mint decided to use their San Francisco facility in 2011 and Philadelphia facility in 2015. Despite their location of origin, the mintmark on all American Silver Eagles was omitted. The coins struck at Philadelphia facility were sealed in monster boxes that said “West Point Mint,” making it difficult to identify where those coins were actually produced. Previously unknown Philadelphia Silver American Eagles became one of the biggest surprises for the numismatic world and the lowest mintage in the 31-year history of the American Eagles. They were identified through their 5 digit serial numbers on the box that began with the #1. The details about the mintage facility were not released to the public until 2017. For that reason, the Mint location could only be known with the information on their 500-coin packaging boxes, commonly called “monster boxes”. Thus PCGS and NGC were able to apply the appropriate mint mark to their labels. 2015 Philadelphia Mint boxes (79,640 pieces only) have a five digit serial number starting with the number 1. Important: Do not confuse this with boxes that have the "WP" prefix, which are struck at the West Point Mint. 2017 West Point Mint boxes have a six digit serial number starting with the numbers 1, 2 and 3, or a five digit serial number starting with the prefix WP. 2017 San Francisco Mint boxes have a six digit serial number starting with the number 4. 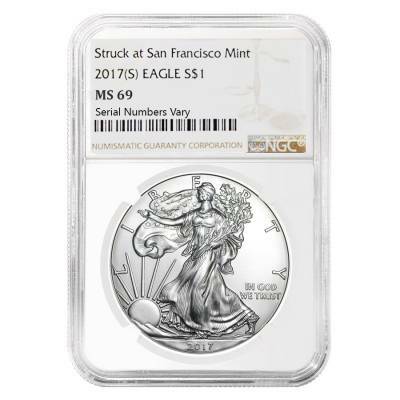 The Numismatic Guaranty Corporation (NGC) subsumes these coins with a mintmark and the facility name, for example, a coin struck at the San Francisco Mint in 2017 will be described as a “2017 (S) EAGLES S1”. This title comes with NGC designations and other special labels. The Professional Coin Grading Service (PCGS) provide the mint attribution by using “S” for San Francisco, “P” for Philadelphia, “W” for West Point, e.g. 2017-(W) and their original labels. Bullion Exchanges is delighted to offer our customers the entire collection of PCGS/NGC graded Silver American Eagles with the mint locations revealed. Coin made from .999 pure silver, weight of 1 troy ounce. NGC MS 69 - A fully struck coin with nearly imperceptible imperfections. Coin was minted at the San Francisco U.S. Mint facility. Actual coin does not have 'S' mintmark. Coin comes in a NGC Standard Brown label. Obverse: Displays Lady Liberty moving toward the sunlight while holding a laurel oak in her hand, symbolizing America’s strength. Design by Adolph A. Weinman. Inscriptions include “LIBERTY,” “IN GOD WE TRUST,” and ”2017”. With Bullion Exchanges, you can feel confident that you will get silver bullion coins of superior quality. Every coin from our bullion selection is 100% authentic, like this astounding American Eagles, thoroughly wrapped and packaged to be safely delivered to your address. If you have any questions, just write us a message, and we will be happy to assist you. classic addition at a good price. thanks again BE for super fast delivery! My order was delivered on time. Eagles are great and I get one every year. no exceptions. Bullion Exchanges is my favorite dealer for this purpose. Always great deals with fair prices. I'm a repeat buyer. American Eagles are the most popular American coin. I believe everyone knows that, and if you really care about adding value to your portfolio. This coin would be a perfect addition! With this purchase, you earn 35 Bullionaire Bucks 35 BB = $0.04. For every $1 spend, you will earn 1 Bullionaire Buck which is equivalent to $0.001 off a future purchase. 35 BB = $0.04.